We have a new moonshot today: to manage half of the surface of the Earth to safeguard the bulk of biodiversity. Just as President Kennedy laid the first moonshot at the feet of the graduating students of Rice University, E.O. Wilson has called on our young generation of scientists from around the world to achieve the grand goal of Half-Earth. The Half-Earth Project is bringing momentum to E.O. Wilson’s vision of Half-Earth, but we will face challenges ahead. One of the most significant challenges will be how to balance the growing human demand for resources with requirements to maintain a healthy ecosystem. The issues are big: establishing sustainable development practices in emerging economies; mitigating human-wildlife conflict; building public support for environmental protection; and many others. 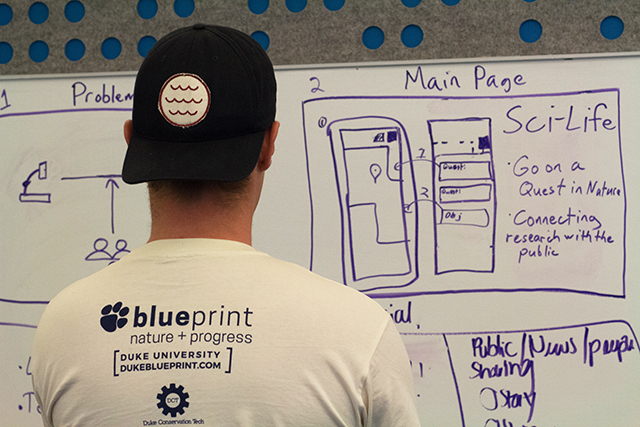 Each challenge will require unique and innovative solutions, and that is what the Duke University BluePrint Conference asked students to create. Earlier this month, I participated as a mentor in the BluePrint “hack-a-thon.” For 24-hours, students and mentors from a variety of backgrounds competed in teams to develop solutions to environmental problems. The goal was for each team to create new approaches to old problems, turning the issue over and over through the lenses of engineering, business, computer science, and other disciplines. At the start of the conference, the organizer, Duke Conservation Tech, introduced the theme “Nature + Progress: focusing on reconciling the natural world with the inevitability of human progress.” After inspirational keynotes from organizations like Conservation X Labs, National Geographic and the World Resources Institute, the teams were off to brainstorm and problem-solve. Through mentoring 5 teams, I learned as much from the students as they learned from me. Tag-teaming with other mentors, we shared our experiences and insights with the students as they honed their designs. The enthusiasm was catching, and I found myself longing to stay with each team a few minutes more to flush out ideas. After just 24 hours, their innovations were astounding: new wildlife monitoring systems to reduce animal-transportation collisions; apps to involve the public in scientific data collection; new architecture plans for building complexes that create electrical energy from compost; and business models that reduced space needed for agriculture in addition to reducing methane output of livestock. The list goes on. Each innovation tackled an essential dilemma and spoke to the challenges we’ll need to address to reach Half-Earth. The Half-Earth Project is eager to see these ideas come to life. We’re inspired by the ingenuity we saw this weekend and the potential that collaboration across sectors brought to solving environmental challenges. With just 150 students, 30 mentors, and 24 hours, new doors were opened for the future of our planet. Kellie Laity, E.O. Wilson Biodiversity Foundation’s Communications and Development Coordinator, has worked on a variety of wildlife management projects, ranging from human-wildlife conflict to behavioral research. She endeavors to inspire conservation action through education, storytelling, and hands-on involvement. The Half-Earth Project has science at its core and our transcendent moral obligation to the rest of life at its heart. In collaboration with our partners, we are working to power one of the grandest conservation efforts of our time, and provide the urgently needed research, leadership and knowledge necessary to conserve half the planet for all of life.